Alison’s voice was comforting and soothing, especially after a long day. She was someone to look forward to. Thank you, Woodstock Whisperer for the sharing the memories. I learned so much about music from Alison as I lay in bed drifting off to sleep each night. Emerson, Lake, and Palmer, Yes, Renaissance, and dozens of other bands and artists came into my life – brought there by Alison. 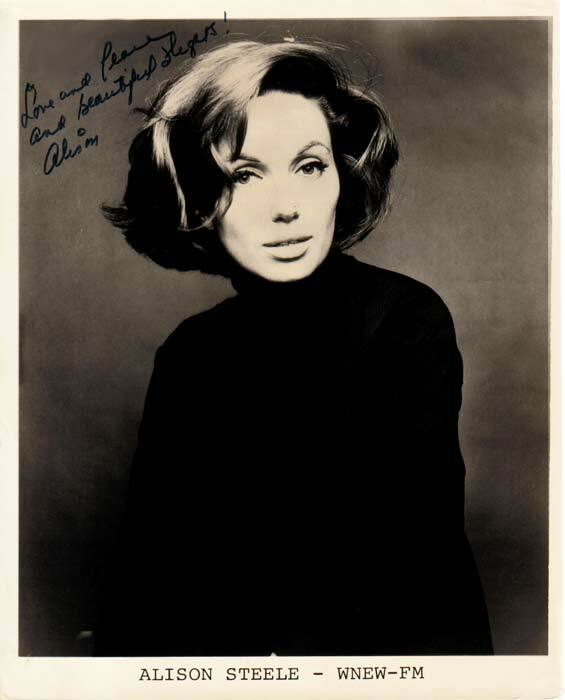 Her voice both educated me and lulled me to sleep throughout my high school years. I don’t think I’ve ever slept as well since then. Not that Alison was boring, that was not the case. She was comforting. She is missed. I guess I shouldn’t be amazed at how many lives WNEW touched in such a personal away. It was certainly true for my wife and me. Thanks for sharing your thoughts. I still call New York classic rock radio WNEW, my son is always correcting me. I keep calling my grandson’s back pack a book bag. He keeps correcting me. I’ll have to be careful with classic rock, too. Thank you and couldn’t agree more! Pretty sure Allison Steele was well treated and respected in the last 10 years of her career by Howard Stern, whom she preceded, at WXRK. 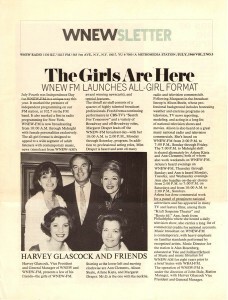 This may not fit in with the WNEW romanticizing tone of the piece, but some of us couldn’t stand the drone of WNEW. We needed it snappier, more to the point, and more irreverent like Howard at his best! Yes, I miss Allison, but she had a good friend in Howard. 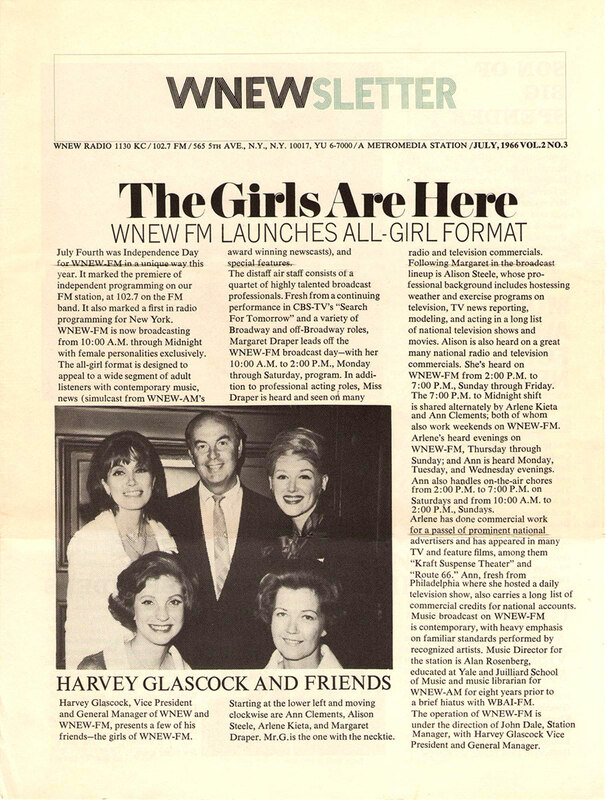 I’m sure the fans of WNEW would not use the word “drone” to describe the station. Often relaxed and typically meaningful without shouting. Not looking for irreverent commentary (as funny as Stern can be), but sense. 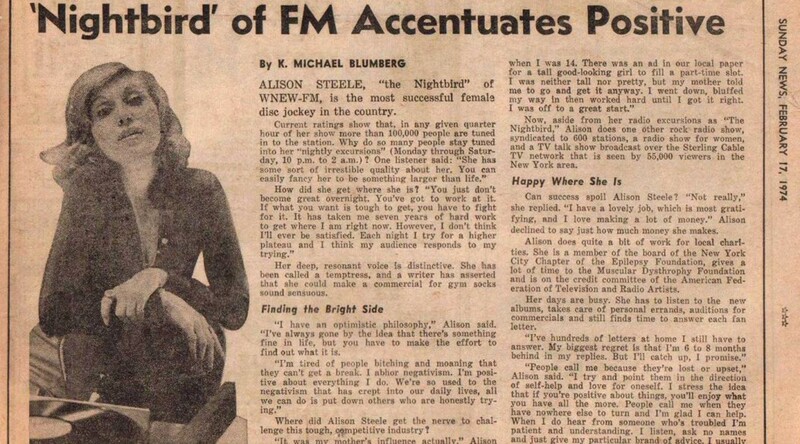 WNEW could be other things, but its DJs spoke to its listeners in a way that connected to many. Listened late at night to a transistor hidden under my pillow, FM was sort of subversive, not being as commercial as WMCA ond 1010WINS and departure from the hit single top 100 format. . Alison delivered the best of the times, and interviewed them all live in the studio. She did a lot for Rock and deserves greater recognition for her immense contribution. Agree completely. Thanks for your comment. Thanks for your comment Joe. She certainly did touch a lot of hearts.